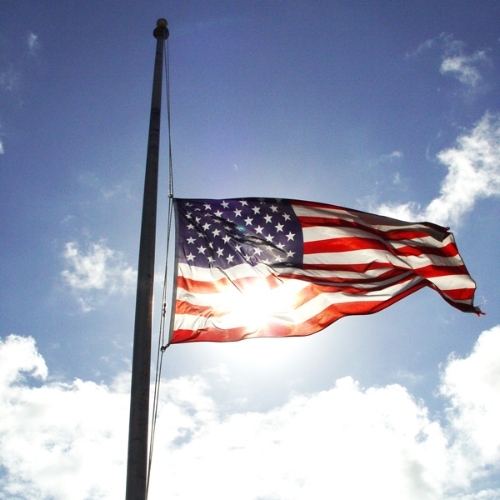 The US flag flies at half-mast, honoring the military lives lost. Many people look at federal holidays as days they don’t have to come in to work, or as days where all the stores are having sales, but these holidays are more than that. Memorial Day is a day of remembrance for those who sacrificed their lives in the military, fighting to uphold the values of our country: equality, self-government, diversity and unity. Without these servicemen and servicewomen, our nation would not have the freedoms we hold dear today. Collectively, the US has not been able to “hold these truths” in recent years. Just as countless lives have been lost in battle, people continue to lose their lives on US soil. Last week, the Washington Post reported on data collected by researcher Zachary Austin that this year, more deaths have happened to students at schools than to deployed military members in combat. Sadly and unnecessarily, some of the civilian deaths in the US have happened by the hands of the men and women who swore to protect us. Guns are meant to protect us from harm, but lately, they have been in the wrong hands. Yet, some citizens seem to care more about their 2nd Amendment rights than the lives of students, their community members. We are left to deal with this by having a nationwide conversation on appropriate and safe gun control. The Declaration of Independence reminds us that it is our right as US citizens “to alter, abolish and institute new Government” when the systems in place disrupt our rights to Life, Liberty and Happiness. That is what activists and protestors are doing when they line up on the streets, stopping traffic and marching up to their government officials’ office and to Congress to demand change, to be seen and to be heard. That is what students did on April 20 when they walked out of class to protest gun violence in schools. That is what Colin Kaepernick and many other football players are doing when they peacefully kneel during the National Anthem. They are using their rights to acknowledge the fatal issue and ask for a solution, contrary to what the media has been informing us. In reality, we are all fighting for the same thing: freedom. However, recently, the NFL released a statement saying that teams will be fined if players kneel on the field during the National Anthem. What the NFL does not honor is that the athletes are not kneeling in disrespect for the troops, but to help citizens and leaders recognize that some police officers are unjustly taking away lives in America. New York Jets Chairman Christopher Johnson responded to the statement saying, “I never want to put restrictions on the speech of our players. Do I prefer that they stand? Of course. But I understand if they felt the need to protest. There are some big, complicated issues that we’re all struggling with, and our players are on the front lines.” Johnson offered to cover any fines his team might incur to protect their right to protest. The freedom of expression and freedom of assembly are as fundamental to our country as the freedom to bear arms, as our servicemen know. We need to balance rights of different citizens, and the only way we can start is by communicating with one another. For democracy is based on thought and discussion. When players kneel, they are kneeling out of compassion for the fallen lives on US soil. When Marjory Stoneman Douglas High School students of Parkland, Florida held the March for Our Lives in Washington, DC after losing 17 lives to a school shooter, they communicated their need to feel protected at school. If we can’t have the conversation, we won’t be protecting anyone’s rights. As we remember what our brave US troops did for us on this day, let us also remember that change still needs to be done within. The fallen troops gave us courage to stand up, or kneel, for what we believe in. We are grateful for the ones who fight for our freedoms abroad and at home.